Most of the fish that I target Offshore are predatory fish. That means that they are fish that hunt and feed on other fish. Spoons and drones and other artificial type baits work for smaller, younger fish. Dragging frozen ballyhoo will snare a nice fish from time to time but the way to catch the biggest, oldest and smartest fish out there is to use the fish that they hunt for Live Bait. 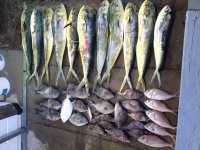 Trolling Live Bait''s range from Menhaden to Blue Fish to Spanish Mackerel up to schoolie King Mackerel just according to what fish you are hunting for. Most of my Trolling, Live Bait fishing is done for King Mackerel in tournaments. I like to use fresh, palm sized menhaden. The fresher the bait the better off you are. Tired, beat up bait will not last long trolled behind a boat. You will know if the menhaden are beat up by looking at their noses. If they are red and bloody looking then you need to work on your bait handling. 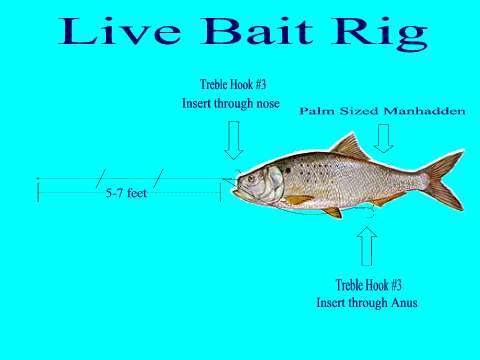 I will leave how to catch and keep the bait for another article and for the sake of this article we will assume that we have on hand, fresh, palm sized menhaden. The next thing we need is a Live Bait Rig. The Rigs that I like to use are wire rigs about 7 feet long made out of 32 lb coffee wire and #3 treble hooks. I like the treble hooks made for fresh water use. Do not use any type of stainless hooks to saltwater fish with or Captain Dave will not tell you any more goodies. The reason for this is that stainless hooks when you break off a fish will last a long long time stuck in the fish. A lot of times this will lead to the demise of the hooked fish. If you use regular hooks, when you break a fish off the hook will rust out in a matter of weeks allowing the fish to resume living a normal life. 32 lb wire is a easy wire to work with and ties easily. I will detail the rig with a picture. IF you do not know how to tie wire then take a look at the article on How to Tie with Wire.